The lovely people over at Bigjigs Rail have decided to raise funds for the Chatham Dockyard Locomotive Restoration Fund and Demelza House Children's Fund by attemptting to break a world record! 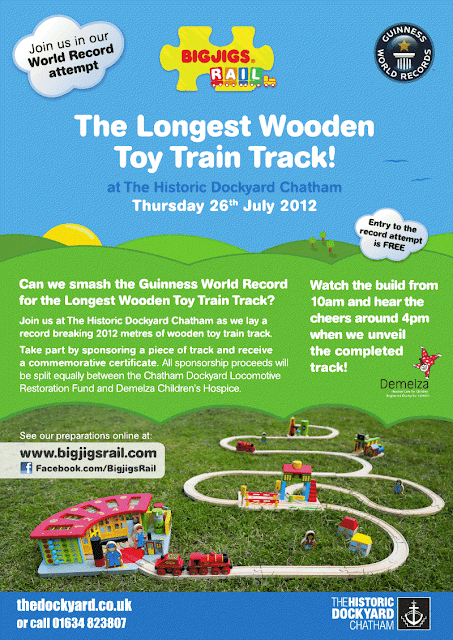 The attempt to create a wooden train track of 2012 metres will take place on Thursday 26th July at the Chatham Dock with the grand unveiling at 4pm. Using a massive 10,000 pieces of track they want to beat the current record of 1650 metres - will you be there to see it? You can watch from 10am! You can help to raise funds for these charities by sponsoring a piece of track for just £1. If you can't attend on the day you can sponsor the track by visiting their Just Giving Sponsor Page. You will also receive a commemorative certificate for doing so if you provide your email address! 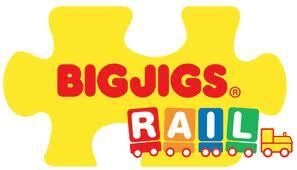 You can follow Bigjigs Rail to see their progress and planning on Facebook, Twitter, their blog and Pinterest. We have sponsored them and wish them the best of luck! !